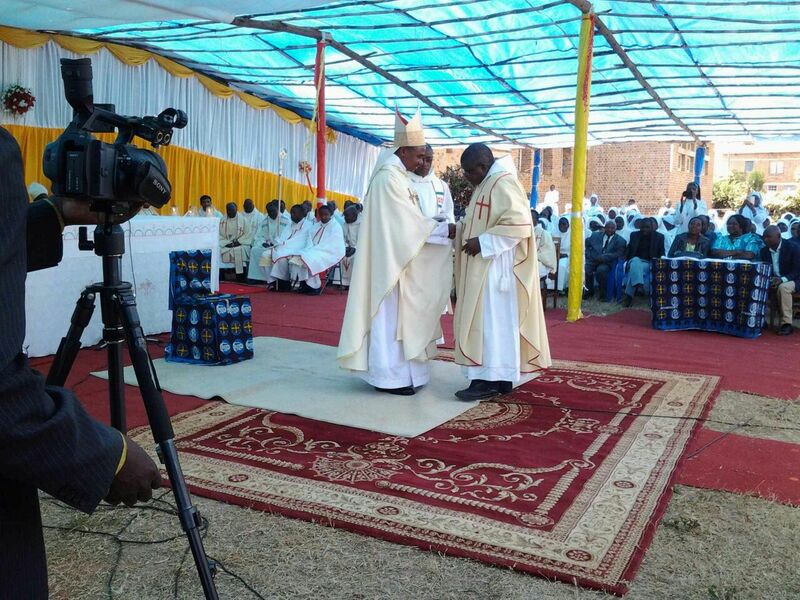 Hanga Abbey: Blessing of Abbot Octavian Massingo, OSB. On Saturday, July 30, 2016, Fr. 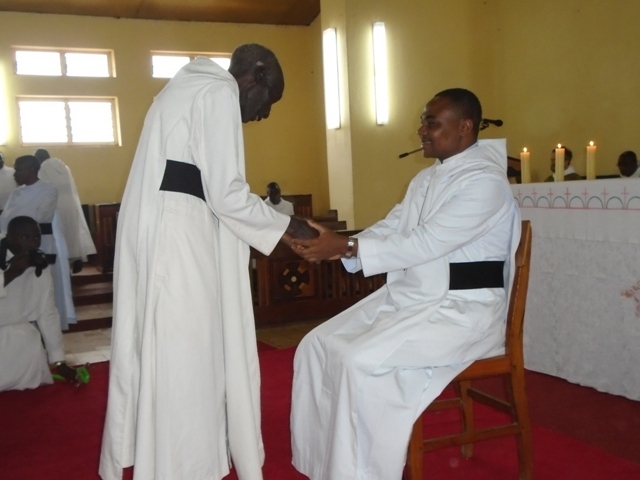 Octavian Massingo, OSB, received a blessing as the third abbot of St. Maurus Hanga Abbey. Fr. Octavian was elected in January by the monks to be their abbot. 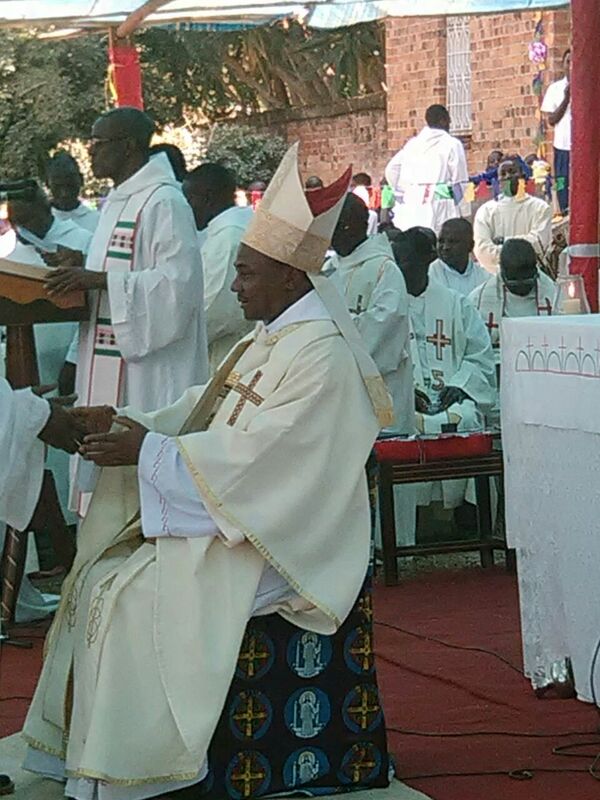 Archbishop Damian Dallu of the archdiocese of Songea presided at the mass of the blessing. 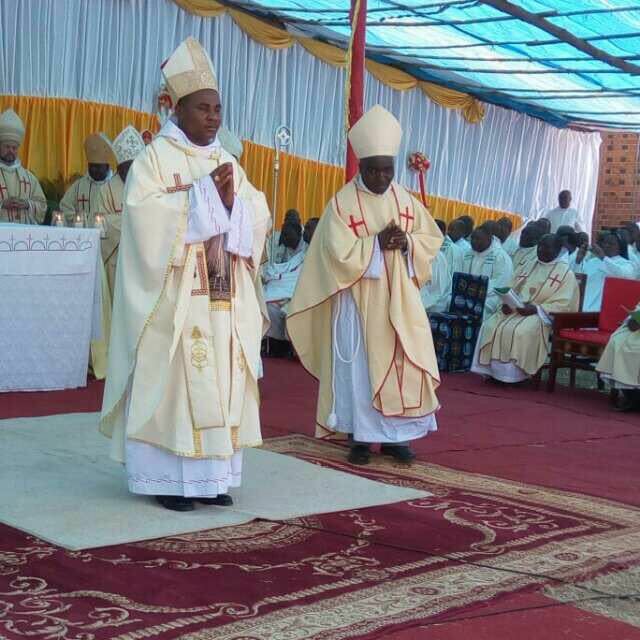 Other bishops present at the blessing ceremony were bishops John Ndimboe of Mbinga diocese, bishop Alfred Maluma of the diocese of Njombe, bishop Edward Mapunda of the diocese of Singida (the native diocese of Abbot Octavian) and the retired bishop of Mbinga diocese bishop Emmanuel Mapunda. 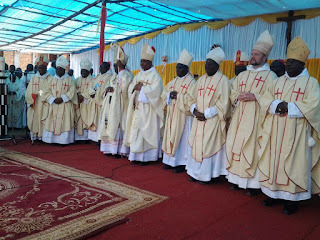 There were also five Benedictine abbots namely: abbot Anastasius OSB, of Peramiho abbey, abbot Placidus Mtunguja, OSB, of Ndanda abbey, abbot Denis Ndomba, OSB, of Mvimwa abbey, and the retired abbots of Hanga, abbots Alcuin Nyirenda, OSB, and Thadei Mhagama and also abbot Basil Ngaponda, OSB, retired abbot of Mvimwa. 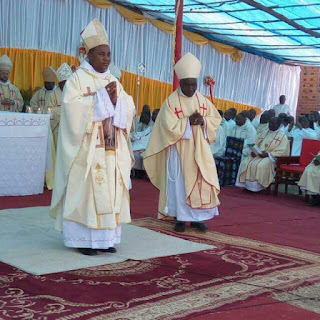 Many priests, nuns and religious men from different communities around the country attended the ceremony not to mention the lay people. Abbot Octavian Massingo, who is 40 years old, takes the chair as an abbot after Abbot Thadei Mhagama, OSB, who headed the community from 2004 to 2016. 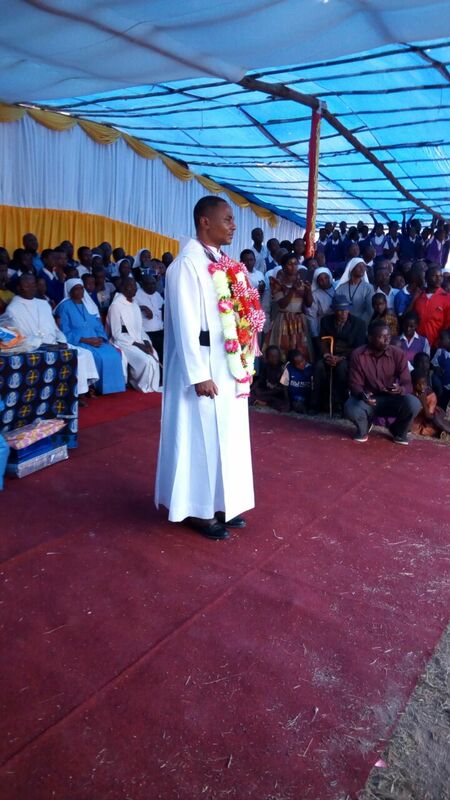 Abbot Octavian was elected in January 2016 and was blessed this July after finishing his Masters degree in administration at St. Augustine University in Mwanza, Tanzania. For the six months January to June the abbey was under the leadership of Prior Frater Jerome Mlelwa, OSB. 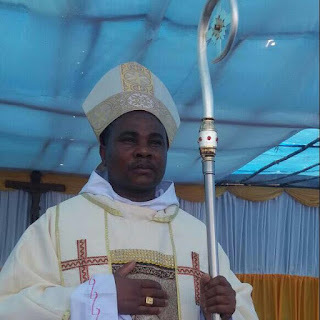 We congratulate Abbot Octavian Massiongo, OSB, for being elected an abbot and accepting the responsibility of being a leader! 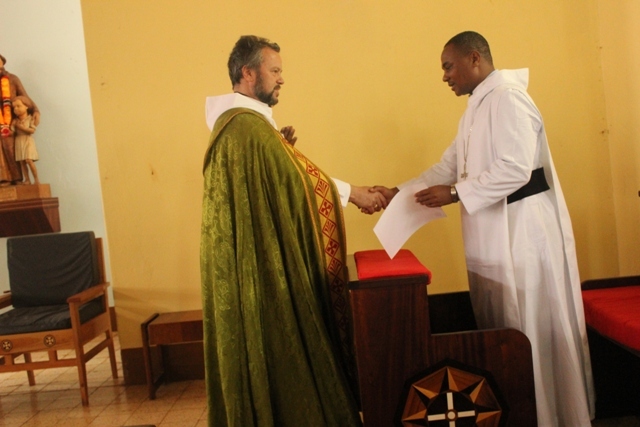 Prior Jerome Mlelwa, OSB, welcoming guests and making introduction of the abbatial blessing ceremony. 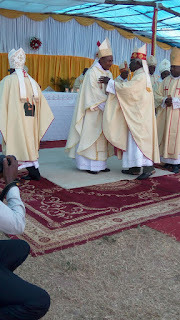 Abbot Octavian after his blessing. 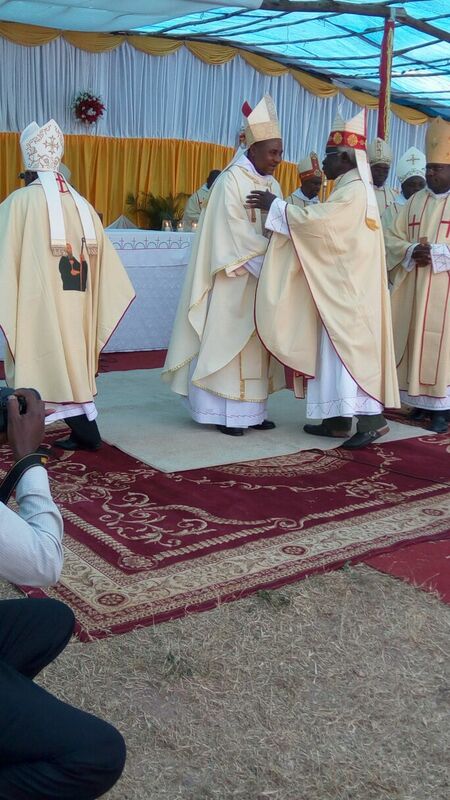 Abbot Octavian with bishop Alfred Maluma of Njombe diocese. 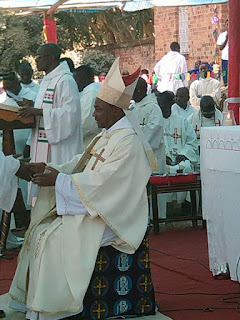 Abbot Octavian with the retired bishop Emmanuel Mapunda. Government officials were present at the ceremony including Namtumbo District Commissioner Happiness Mamlima. Lighano monastery is a diocesan religious community of men in the archdiocese of Songea in Southern Tanzania. The Brothers under the diocesan bishop, lead monastic life following the Rule of St. Benedict but they are not called Benedictines. 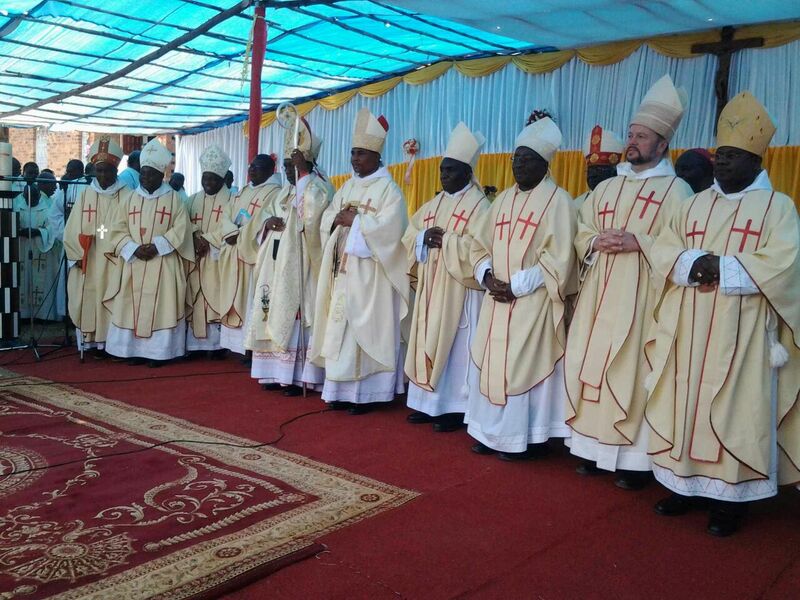 They have adopted a missionary spirit under the patronage of St. Paul the apostle. For sometime they have been struggling with getting formators for their novices. 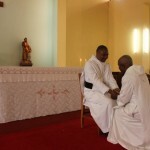 Then the archbishop, Damian Dallu, asked the monks of Hanga Abbey to take charge of novices from Lighano for their monastic life formation, at least for a moment. 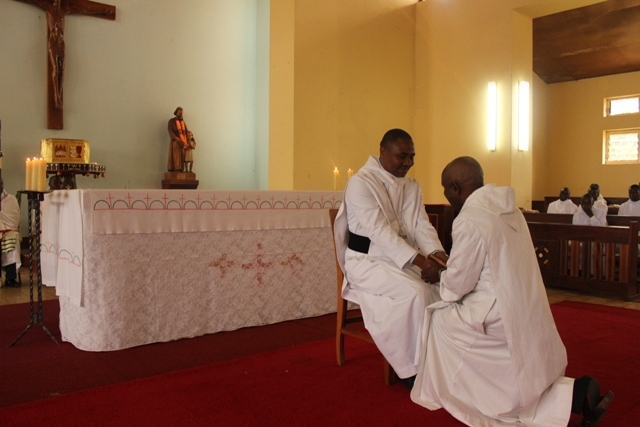 Indeed it happened with two novices coming to Hanga in September of 2015. This July the novices have returned to Lighano Monastery and will make their first profession in August. 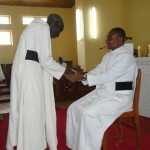 We pray for the two novices and for Lighano monastery Brothers to grow in number and holiness. In the photo: the two novices from Lighano Monasery and Fr. Onesmo. 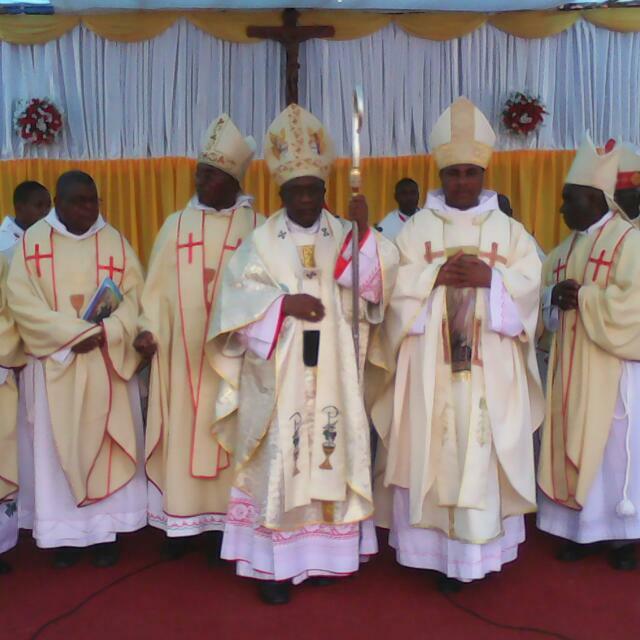 From left novice Stefano Miteka, Fr. Onesmo Komba, and novice John Paulo Tawa. 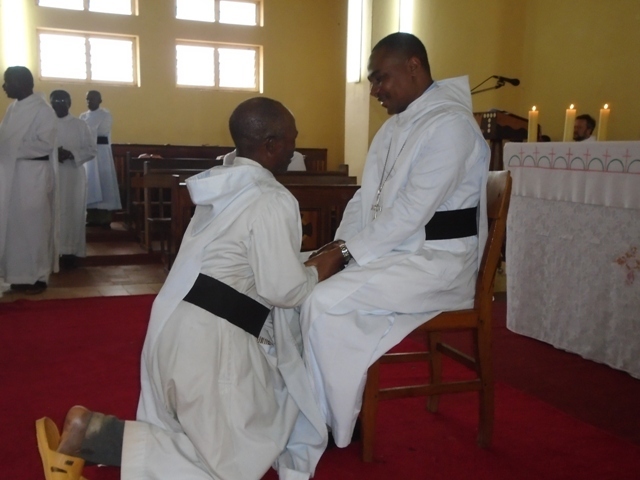 Prior Frater Jerome Mlelwa, OSB, saying a word of goodbye to the novices. On July 9th Fr. 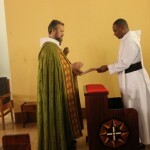 Octavian Massingo, OSB, was installed as the new abbot of Hanga Abbey. He was elected in January 23, 2016. He was not installed sooner so that he could finish his Master's Degree studies which he completed this last June. 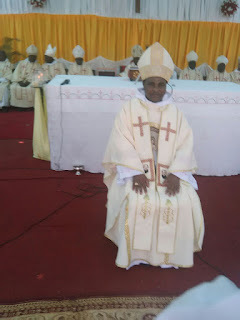 In the photo: Abbot Octavian at the superiors chair ni the abbey church. 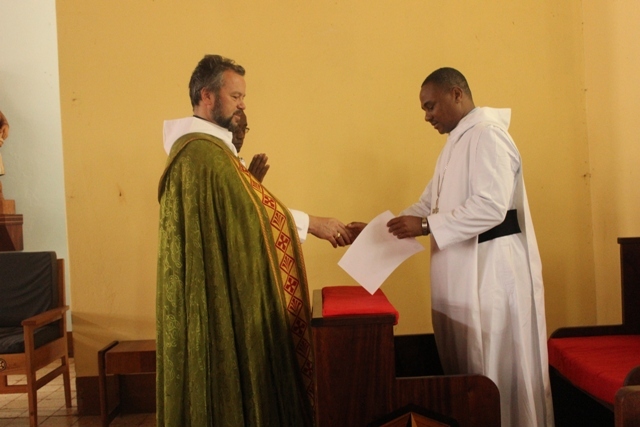 The installation ceremony took place during vespers in the presence of the monks of Hanga Abbey. 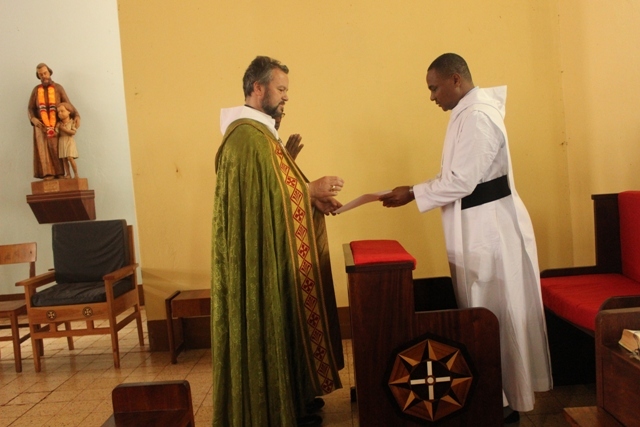 The ritual was carried by Abbot Anastasius of Peramiho abbey in the name of the abbot president of St. Ottilen Congregation, Archabbot Jeremias. 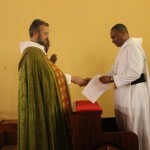 It involved the installing abbot to lead the new abbot to the official superior chair in the abbey church and being given a document of his installation. Then all the monks present had the opportunity to shank hands with the new abbot. 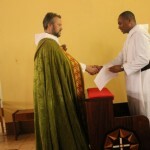 Finally, the new abbot gave his first abbatial blessing to the monks. Later on on July 30 the new abbot will receive a blessing by the archbishop of the archdiocese of Songea in which ceremony many people and invited guests will attend. 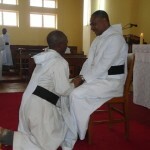 In the photo: Abbot Anastasius installing the new abbot at the abbatial chair in the abbey church.